Below is a brief historical outline from RK Peacock, Evolution of Australian Light Horse Regiments 1841-1935, Unpublished MSS, c.1936, p. 3. The flame which kindled the fire bringing the regiment into existence dates back to the year 1841 when a Squadron of Cavalry was raised in Adelaide. 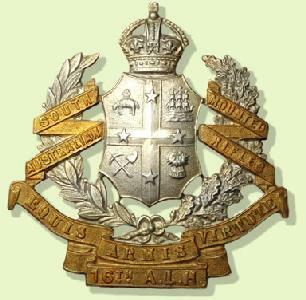 During 1844 a small reorganisation was effected brining forth the Adelaide Mounted Rifle Corps, which, by 1867 was composed of four troops, vis. No. 1 Molong Troop; No. 2 Strathalbyn Troop; No. 3 Adelaide Troop and No. 4 Reedbeds Troop. In 1899 the Adelaide Mounted Rifle Corps had become the South Australian Mounted Rifles and No 3 Adelaide Troop became No. 1 Squadron, together with portion of troops at Yankalilla, Inman Valley and Victor Harbor. By 1901 the No. 1 troop at Adelaide became the active portion of the mounted rifles the remainder being styled the reserves. In the Federal reorganisation of 1903 No. 1 Squadron (active) and No. 2, 4 and 5 Squadrons (reserve) were formed into a regiment styled 16th Australian Light Horse Regiment (South Australian Mounted Rifles) with four Squadrons, also an attached squadron designated No. 5 Squadron. At the reorganisation of 1912 Nos. 2, 3 and, 4 Squadrons of the 16th, A.L.H. Regiment, together with No. 4 Squadron of the 17th. A.L.H. Regiment became the 22nd Light Horse (SAMR) whilst No. 1 Squadron of the 16th formed the nucleus of the 23rd. Light Horse (q.v.). The other changes which followed this regiment did not occur until 1918 when the 22nd. Light horse continued as the 3rd. Light Horse (South Australian Mounted Rifles) and as such it continued until the Divisional re-organisation of 1921 when part of the 3rd. Light Horse Regiment and part of the 30th. Light Horse Regiment became designated 3rd. Light Horse Regiment (South Australian Mounted Rifles). This section explores the evolution of the Regiment from its first origins as a Commonwealth formation. Each year maps the movement of men and often locations of the various Squadrons and Troops. To get the flavour of the Regiment, it is best to begin the journey at 1903 and follow though each year till 1920. The Roll of Honour contains the names of all the men known to have served at one time with the 16th/22nd Australian (South Australian Mounted Rifles) Light Horse and gave their lives in service of Australia during the Great War. Albert Henry BACKLER, 32 Infantry Battalion, Killed in Action, 20 July 1916. Arthur John BARLOW, 4th Divisional Ammunition Column, Killed in Action, 28 November 1916. Alfred Edward COOK, 9th Light Horse Regiment, Died of Wounds, 4 July 1915. Arthur Christopher DOWN, 9th Light Horse Regiment, Died of Wounds, 9 October 1918. George GAVENS, 24th Infantry Battalion, Killed in Action, 15 June 1918. Keith HARRINGTON, 4th Light Horse Regiment, Died of Wounds, 6 August 1915. Allen Stuart McARTHUR, 1st Light Horse Regiment, Killed in Action, 18 May 1915. Donald NICHOLSON, 3rd Light Horse Regiment, Died of Disease, 11 October 1918. Henry Gordon PACKER, 50th Infantry Battalion, Died of Wounds, 12 June 1918. Carew REYNELL, 9th Light Horse Regiment, Killed in Action, 28 August 1915. Frank Milton ROWELL, 3rd Light Horse Regiment, Died of Disease, 8 August 1915, and subsequently buried at sea. Frank Harris RUMBELOW, 48th Infantry Battalion, Killed in Action, 12 October 1917. Lance SWIFT, 10th Infantry Battalion, Killed in Action, 21 March 1918. Sydney Louis SWIFT, 3rd Field Artillery Brigade, Died of Wounds, 25 August 1918. William Henry THOMAS, 48th Infantry Battalion, Killed in Action, 11 April 1917. Boxer Allen WARE, 3rd Motor Transport Company, Killed in Action, 10 October 1918. 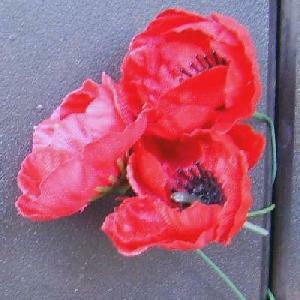 The following Nominal Roll contains the names of all the men known to have served at one time with the 16th/22nd/3rd Australian (South Australian Mounted Rifles) Light Horse who undertook service for Australia during the Great War. Each entry details the full name of the man, his service number and rank upon enlistment, and finally the unit in which the man was allotted prior to embarkation. 1511A Private Hugh Alexander AGNEW, 9th Light Horse Regiment. 2447 Private Jack ANTONIO, 9th Light Horse Regiment. 221 Private William Ernest ASLAT, 9th Light Horse Regiment. 2773 Private Lindsay Lealand ATTRILL, 43rd Infantry Battalion. 261 Private Albert Henry BACKLER , 32nd Infantry Battalion. 1840 Private Arthur John BARLOW, 3rd Light Horse Regiment. Lieutenant Charles Frederick BARNETT, 3rd Light Horse Regiment. 3586 Acting Sergeant Henry Love Kelynack BARTLETT, 3rd Light Horse Regiment. Second Lieutenant John Theodore BIGG, 3rd Light Horse Regiment. 3708 Private Alex Thomas BLACKWELL, 7th Field Ambulance. 1844 Acting Corporal Arthur Andrew BRATCHELL, 3rd Light Horse Regiment. 510 Private John Hugh BURNS, 10th Light Horse Regiment. Major Charles Phillip BUTLER, 43rd Infantry Battalion. 500 AB Driver Cyril Herbert CLARK, Royal Australian Naval Bridging Train. Major Alfred Edward COOK, 9th Light Horse Regiment. 83 Corporal George Owen DENT, 3rd Light Horse Regiment. Lieutenant George Arthur DEPLEDGE, 9th Light Horse Regiment. 2103 Private Eric Curlewis DOUGLAS, 9th Light Horse Regiment. 921 Private Arthur Christopher DOWN, 9th Light Horse Regiment. 62079 Private James Colin DUNCAN, 4th General Service Reinforcements, South Australia. Lieutenant Colonel Daniel FINDLATER, Sea Transport Service. 4695 Acting Sergeant George GAVENS, 24th Infantry Battalion. 3078 Private Lawrence Alfred GRAY, 3rd Light Horse Regiment. 973 Private Frank Eric HAMILTON, 11th Light Horse Regiment. 268 Private Keith HARRINGTON, 4th Light Horse Regiment. 3325 Private Frank Stanley HENDERSON, 43rd Infantry Battalion. Second Lieutenant Cecil Austin HEWITT, Australian Flying Corps. 516 Sergeant Bugler Victor HOWE, 11th Light Horse Regiment. 2935 Private Eric JAMES, 3rd Light Horse Regiment. 3138 Acting Corporal Basil Clarence JARVIS, 9th Light Horse Regiment. Dr Major Frederick David JERMYN, 4th Field Ambulance. 1942 Private Theodore Michael KEANE, 48th Infantry Battalion. 64540 Private Alexander Sackville KIDMAN, 6th General Service Reinforcements, Victoria. 3706 Private Eric KIDMAN, 7th Field Ambulance. Captain George KING, 43rd Infantry Battalion. 5234 Private Thomas KING, Field Butchery & Bakery. 64250 Private Adrian Joseph KORFF, 5th General Service Reinforcements, South Australia. 62108 Private David Francis LAMEY, 4th General Service Reinforcements, South Australia. Lieutenant Park Alexander McEdward LAURIE, 3rd Light Horse Regiment. 864 Private Donald LENNARD, 9th Light Horse Regiment. 52893 Private Reginald Channon LEWIS, 2nd General Service Reinforcements, South Australia. 1615 Private Arthur Lindsay LOCK, 3rd Light Horse Regiment. 91 Private Clarence Wesley LOLLER, 3rd Division Cyclist Company. 4737 Private Albert Stanley Moore LOVELL, 32nd Infantry Battalion. 1190 Private William Robert LOVELL, 3rd Light Horse Regiment. 1570 Private Ernest Albert LUDWIG, 9th Light Horse Regiment. 161 Private Harold Robert MACK, 3rd Light Horse Regiment. 3421 Private Otto William MacWATTERS, 3rd Light Horse Regiment. 2337 Private John Dennis MAHONEY, 3rd Light Horse Regiment. 256 Private Alfred Leslie MAIDMENT, 3rd Light Horse Regiment. Lieutenant Norman Maxwell MALCOLM, 9th Light Horse Regiment. 2041 Private John MANHOOD, 3rd Light Horse Regiment. 2939 Private John Douglas MANTON, 3rd Light Horse Regiment. 162 Private Thomas George MARSHALL, 3rd Light Horse Regiment. 163 Private Harry MARTIN, 3rd Light Horse Regiment. 323 Private Herbert Horace MARTIN, 3rd Light Horse Regiment. 896 Private Alexander John MATHESON, 11th Light Horse Regiment. 63 Private Edwin Overington MATTHEWS, 3rd Light Horse Regiment. 5836 Sergeant Herbert Woodland Rice MATTHEWS, 4th Light Horse Brigade Train. 534 Private Allen Stuart McARTHUR, 1st Light Horse Regiment. 2937 Private Alexander Malcolm McFARLANE, 3rd Light Horse Regiment. 1 Regimental Sergeant Major Roderick Andrew McFARLANE, 3rd Light Horse Regiment. 3124 Private Leslie McGREGOR, 9th Light Horse Regiment. 3419 Private Harold Rolston McINTOSH, 3rd Light Horse Regiment. 1589 Acting Corporal William Pascoe McINTOSH, 9th Light Horse Regiment. 2341 Private George Edward McKENZIE, 3rd Light Horse Regiment. 714 Private Lochlan Marcus McKINNON, 1st Remountsts. 222 Sergeant James Francis McLACHLAN, 3rd Light Horse Regiment. 3603 Private Robert James McLEAN, 3rd Light Horse Regiment. 80 Corporal William McNAMARA, 9th Light Horse Regiment. 1875 Private Charles Lloyd MILLER, 3rd Light Horse Regiment. 1422 Private Harry MORRIS, 9th Light Horse Regiment. 3480 Private Philbert Keith MORRIS, 9th Light Horse Regiment. 3012 Sergeant Arthur Harold MORTIMER, 43rd Infantry Battalion. Lieutenant George Louis Henry Ruick MUELLER, 9th Light Horse Regiment. 170 Private Donald NICHOLSON, 3rd Light Horse Regiment. 332 Private Albert Edward OLIVER, 3rd Light Horse Regiment. 2718 Private Henry Gordon PACKER, 50th Infantry Battalion. 17061 Sapper James Grier PANNELL, 5 Div Sig Co.
Major Harry Meshach PARSONS, 9th Light Horse Regiment. Major John William PARSONS, 11th Light Horse Regiment. 64895 Private James Andrew PATTERSON, 7th General Service Reinforcements, South Australia. 56119 Private Leslie Harold PEARCE, 3rd General Service Reinforcements, South Australia. 3457 Private George PREECE, 50th Infantry Battalion. Lieutenant John Gregory PRIOR, 1st Field Bakery. 52891 Acting Sergeant George William Melrose REECE, 2nd General Service Reinforcements, South Australia. Major Carew REYNELL, 9th Light Horse Regiment. 4353 Private Arthur Newman RISCHBIETH, 32nd Infantry Battalion. 6766 Private George William ROFFEY, 27th Infantry Battalion. Lieutenant Colonel Frank Milton ROWELL, 3rd Light Horse Regiment. Lieutenant Sydney Fairbairn ROWELL, 3rd Light Horse Regiment. 1815 Private Frank Harris RUMBELOW, 32nd Infantry Battalion. Second Lieutenant Miles Francis de Grave SELLS, 27th Infantry Battalion. 19141 Sapper Frederick John SHEATHER, 1st Division Signals Company. Second Lieutenant Frank Lindsay Gordon SMITH, 3rd Light Horse Regiment. 8728 Driver Stephen Francis SUMMERFIELD, 3rd Field Company Engineers. 6829 Private Lance SWIFT, 10th Infantry Battalion. 1449 Private Sydney Louis SWIFT, 9th Light Horse Regiment. 2253 Private William Henry THOMAS, 48th Infantry Battalion. Second Lieutenant Dalzell TRIMMER, 32nd Infantry Battalion. 2950 Private William Alfred TURNER, 3rd Light Horse Regiment. 11118 Driver Boxer Allen WARE, 3rd Division Train. Lieutenant Francis Michael WHITE, 3rd Light Horse Regiment. The Right Honorable Algernon Hawkins Thogond Keith-Falconer Earl of Kintore, PC, GCMG. Lieutenant Colonel George Henry Dean, VD, 5 November 1900. Captain Alfred Edward Cook, Boer War Veteran, 30 November 1898. Lieutenant Frederick David Jermyn, Honorary Captain, Boer War Veteran, 28 October 1898. Captain John Desmond, Boer War Veteran, 29 May 1903. Lieutenant Harold Benedict Edwards, 10 March 1899. Captain James Hay, 24 May 1900. Lieutenant Arthur William Simpson, 8 February 1900. Lieutenant William John Reid Hutchinson, 8 February 1900. Lieutenant Bently Sievewright Connor, 31 May 1901. Honorary Lieutenant Gerald Gleeson Ayliffe, 28 February 1901. Lieutenant Frank Milton Rowell, Boer War Veteran, 11 March 1899. Major Richard Lovelock, 31 March 1901. Lieutenant Ernest Robert Mayfield, 1 April 1897. Lieutenant George Vidle James Roper, 18 July 1900. Captain Joseph Francis Humphris, DSO (Brevet Major), 1 July 1900. Lieutenant Dashwood Charles Connor, 25 May 1900. Lieutenant Donald Alexander Campbell, 14 January 1897. Lieutenant George Thomas Herbert, 31 October 1900. Captain Thomas Landsdrowne Browne, 5 November 1900. Captain Daniel Findlater, 26 September 1902. Lieutenant Ernest Edward Stuckey, 4 September 1900. Honorary Lieutenant James Douglas Tolmer, Boer War Veteran, 28 February 1901. Lieutenant Philip Henry Priestly, Boer War Veteran, 9 May 1900. Lieutenant Benjamin Brookman Ragless, 1 July 1902. Lieutenant William Coleman Addison, 25 July 1903. Lieutenant Albert Miell, Boer War Veteran, 5 October 1900. Lieutenant Thomas Hancock, 18 June 1900. The 16th Australian Light Horse Regiment was envisaged to contain both full time Light Horsemen from No. 1 Squadron, some 72 men including officers and other ranks and three reserve squadrons composed of parrt time soldiers. The other half of No. 5 (Half) Squadron was based at Blackwood but was not incorporated into the 16th Australian Light Horse Regiment. The former No. 5 (Half) Squadron, Blackwood (Mounted Rifles Reserve Force) was formed into an independent squadron of the Australian Light Horse and attached to the 16th Australian Light Horse Regiment for training purposes. Captain Frederick David Jermyn, Boer War Veteran, 1 July 1903. 2nd Yankalilla - Myponga - Port Victor Squadron. 3rd Mount Gambier - Millicent Squadron. 4th Narracoorte - Lucindale Squadron. Lieutenant James Douglas Tolmer, Boer War Veteran, 19 December 1903.